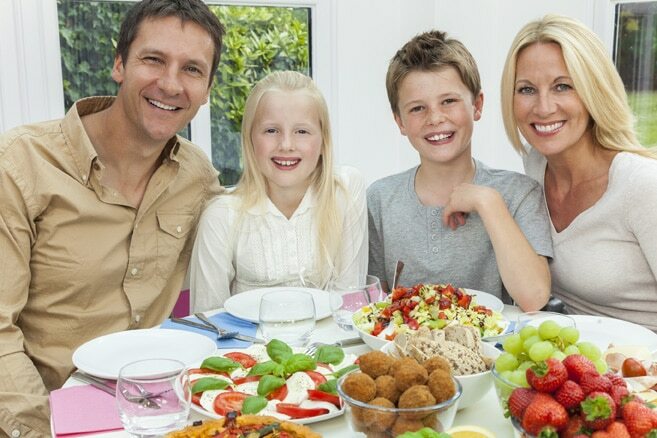 To keep yourself and your children healthy and maintain good bowel health on an ongoing basis, make the following dietary guidelines your normal, regular diet. Everyone in your family should follow these guidelines, whether they suffer from gut issues, or not, since they get the disease-causing elements out of your daily diet and replace them with health-promoting foods. • No processed, pre-packaged foods. It doesn’t matter if it’s organic; if it comes in a package on a shelf, the nutrients have usually been compromised or denatured – boxed breakfast cereal with extruded grains are a good example of this. Eat fresh! • No foods containing preservatives, nitrates & nitrites (these have actually been banned by the FDA, as they are so carcinogenic to the gut, but the meat industry refused to comply and so they are still in all your commercial hot dogs and deli meats), monosodium glutamate (MSG – it interferes with neural functioning), carrageenan (large quantities have been used to induce Ulcerative Colitis in guinea pigs and primates), or anything else that sounds like a manufactured chemical compound. • No margarine or butter substitutes – often treated with chemical solvents and bleaches, resulting in deformed, highly toxic, trans-fatty acids. Even the cold-pressed margarines are not good as your body doesn’t need so much of those oils, and they prevent you from using butter – which your body needs a lot of. Use real organic butter (from raw milk if you can get it), cold-pressed virgin olive oil, or unrefined coconut oil instead. Do not use regular mayonnaise either – use only mayonnaise made from cold-pressed oils. • No artificial sweeteners of any kind (like aspartame, nutrasweet, saccharine, splenda, sucralose, acesulfame-K, etc.) – these are toxic and proven to cause memory loss, can also be highly addictive and contribute to hyperactivity and seizures in some people. No artificial colors or flavors – especially since the introduction of neural flavor blockers and enhancers. • Keep your sugar intake as low as you can. Use stevia, honey, rapadura sugar, molasses, maple syrup instead when you need sweetness. Here are some healthy treat recipes to get you started. I teach my kids to save their sugar for when it counts – this means you only have a sugar item when you REALLY want it and then you stop eating as soon as you’re not super lovin’ it. For detailed dietary information on what to eat and how to prepare your foods for maximum nutrition and absorption, see the articles database at: www.westonaprice.org or purchase the cookbook, Nourishing Traditions.